Ryland Peters & Small, 9781788790680, 144pp. 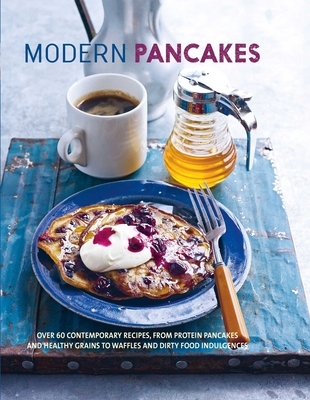 They’ve always been a popular quick and easy treat, but modern pancakes and waffles are traversing the stodgy breakfast boundaries of yesteryear, and breaking free to be served at breakfast, lunch, and dinner tables at every occasion and to suit everyone. For gym buffs, there are protein-rich pancakes to fuel a workout, or a rainbow-spectrum of super-food-stuffed pancakes into which you can whisk your five-a-day. Filling yet healthy porridge oats, buckwheat or chia seeds are ideal for starting your day in a more nutritious way, and foodies can indulge in the latest food trends in pancake or waffle form. Savory versions are also a revelation! Try Carrot, Chickpea, and Turmeric Pancakes with a lemon spiked dressing, Creamy Mushroom-filled Socca-pancakes, or Huevos Rancheros Waffles; the perfect light meal for one or two. Drizzled with sauces, stuffed with fillings, or made with fruit or vegetable bases, these modern pancakes and waffles are flipping fantastic.